BURLINGTON, ON – Husband-and-wife entrepreneurs and motorcycle enthusiasts Trevor & Jan Telford launched Biker-Beer, a new biker-oriented lager, with a kick-off party yesterday at Faloney’s in Ancaster, Ontario. Biker-Beer is an easy drinking beer that has been designed and brewed for those who ride motorcycles, and those who wish they did. 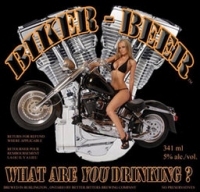 With 161,000 motorcycles registered in the province of Ontario, Biker-Beer is appealing to all of those who ride a motorcycle to try Biker-Beer, and help take us across Ontario this summer. The Telfords hope to use Nickel Brook’s connections to have the beer distributed to bars and restaurants across the province. A Lager? how original !